On this rainy morning, the little one and I headed out to Michaels. I haven’t been there in a while and had to control myself to stay within my budget.Look at what I foundin the $1 aisle. That’s right. 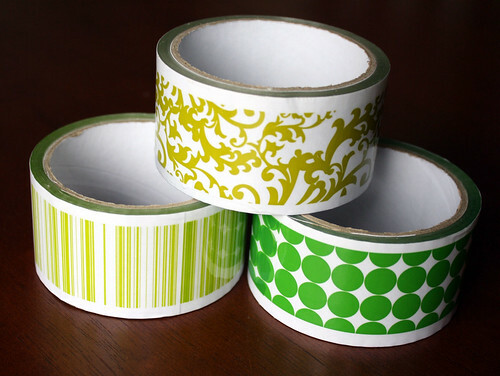 Just $1 for each roll of adorable packing tape! I had wanted some cute packing tape for a while, but couldn’t bring myself to pay the money for it, so this was a pleasant surprise. The tape is clear with the print on it (the white cardboard it’s on makes it look white, but it isn’t). So if you have been on the lookout for some cute packing tape, I highly suggest you go check out Michaels if there’s one near you. Thanks for the info! I have been loving that cool tape, but it was just too expensive. Michaels here I come! Great blog by the way. Love the packing tape! I saw it there too but different patterns. I like what you found. How fun! What great tape! Thank you for the heads up! I send lots of packages and this would sure make them prettier! Holy stinking cuteness!! I have been looking at the decorative tape at Joann’s but it’s is SPENDY!!! I will be visiting a Micheal’s this weekend and now I HAVE to go there if only to get this cute tape. Thanks for enabling 🙂 I really do appreciate it. Oh I love it!! Michael’s dollar bins are the best. I will definitely have to pick some of that up the next time I am out! Thanks for sharing! When I first saw the small pic on my google reader I thought you had made big bracelets…but now that I see it’s tape…I’m thinking…why not use the tape on those chunky wooden bracelets anyways! Super cute find! How cute! I love the $ aisle at Michaels. They have the best stamps there! Oh I am so going there tomorrow! WOW! I love those.. How many inches of tape are they? I see some crafty card making in your future! Wow, that stuff is great! There is, in fact, a Michaels near me, and so I will be heading there soon! Thanks for the tip. How cute! I’ve never seen printed packing tape. Maybe I just hadn’t been looking! I already threw out the packaging so I’m not sure, but it’s a decent amount. It looks like way more than comes on a plain thing of packaging tape from the dollar store. Doh! I *knew* I should have stopped at Micheal’s when I was out running around yesterday! So fun! We just have the boring brown one here in germany. 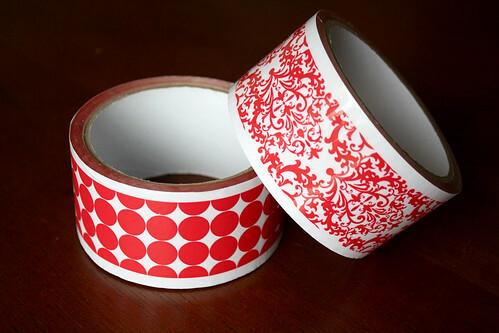 Of course you can buy coloured and fancy tape, but way too expensive! LOVE IT! Really really love it! I’ve been rather out of the loop lately with my computer being repaired, but now that it’s back, so are my bookmarks! So I’m just now reading this. Great find! I will definitely be heading to Michael’s to look for it. Thanks for sharing! Don’t ya just love Michael’s $1 section??! !